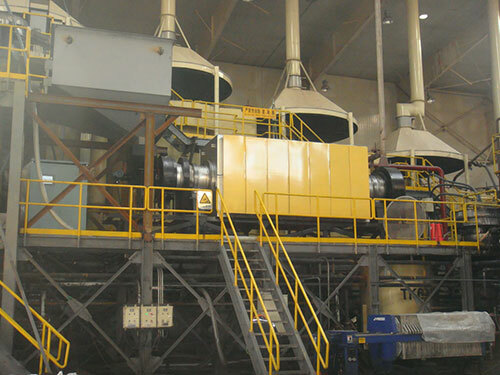 QSY Rotary Kiln is mainly used for activated carbon regeneration in Gold CIP Production Line. After gold loaded carbon desorption, it is washed by dilute sulphuric acid or nitric acid to remove the accumulation such as calcium carbonate, after several working cycle, the carbon must be thermodynamic activation to regain the activity. The thermodynamic activation is done in the QSY rotary kiln. To heat the carbon in 700℃ under the conditions of air isolation,holding 30 minutes, and cooled in the quench tank, screening by the 16 mesh screen to remove the fine carbon, the regeneration active carbon return to the carbon adsorption circuit. This process is the core part of adsorbs gold from cyaniding pulp by active carbon: including 7 steps, leaching pulp preparation, cyaniding leaching, carbon adsorption, gold loaded carbon desorption, pregnant solution electrodeposit, carbon regeneration, leaching pulp.It is very useful gold recovery method in mineral processing.